Our guest house is a fully furnished 5 bedroom house located in a small town in the middle of Amish Country. There are lots of restaurants and shops nearby for your enjoyment. 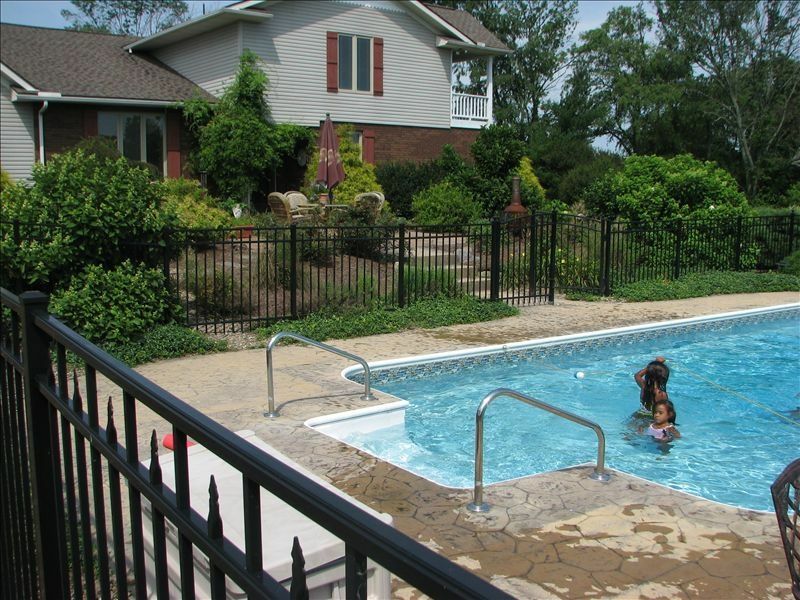 A swimming pool, playhouse, swingset, and lots of room outside to sit and relax on the patio beside the pool. Two of the bedrooms lead out to a balcony. The kitchen has a sliding door out to a deck. The family room has a wood burning fireplace, built in bookcases with lots of books and magazines, a TV and sliding doors leading out to a screened in porch. We also have an office with a desk and a couch that opens up to a bed which would give sleeping room for two more people. The dining room has a large table, ideal for groups, and also a smaller table w/4 chairs. Hi, I'm Kate .....I love meeting all the lovely people that come to spend some time at our guest house! It has been so much fun and i have met so very many of you beautiful people and i especially enjoy when you come back year after year! I try my best to make your stay here enjoyable and look forward to this next year! Come see us! Thank you so much! We love having you here! Kate’s Guest House was perfect for our girls get away weekend! We enjoyed our weekend! There was plenty of room for all 10 of us. It was close to shopping and restaurants. We went there for a family girls trip, and had a wonderful time. Plenty of space for 8 of us ranging in age from 87 to 14. A great place to revive after a long day shopping! The house is as stated in description. It’s a great vacation home for families to gather. Kate is easy to work with and addressed our very few questions. We enjoyed our stay in this very spacious, clean, comfortable, and beautifully decorated home. Please be aware this house has 4 different levels and many steps. All the bedrooms and 2 full baths are on the top level, including a large master suite. The half bath is on the first level, along with the family room with TV. It is very quiet and peaceful here. There is a wonderful pool and much outdoor seating. Please note, on Township Road 603 look for the sign below some mailboxes. Use the long driveway next to another house, you cannot see the guest house from the road. Way better I’m person. Pictures do not do this place justice!! And Kate is an awesome person. Couldn’t ha e had a better get away trip. The pool was 9 feet deep and was amazing! Couldn’t have asked to stay at a better place. You guys are the best! Already looking forward to the next time I get to have y’all back and I get to see that sweet baby! Thank you both for coming! Kate's Guest House is in the country but only minutes away from all the amish tourist attractions. Plenty of shops, and restaurants for you to enjoy! The Antique Festival, Swiss Festival, July 4th fireworks shows are just a few of the many things you can enjoy while staying at our guest house....The Amish Farm and the Rolling Ridge Ranch are great places to take your families to.